Our moderate trips require an average level of fitness. Itineraries may include walks or short hikes of up to two to three hours with little elevation gain, sustained walking at higher altitudes, and/or other similar level physical activities. Many activities are optional. Easy: Our easy tours generally require fairly little exertion. Each day will involve walking, sightseeing and general travel-related activities such as getting in/out of vans, planes, boats, and zodiacs. Moderate: Our moderate trips require an average level of fitness. Itineraries may include walks or short hikes of up to two to three hours with little elevation gain, sustained walking at higher altitudes, and/or other similar level physical activities. Many activities are optional. Difficult: Our difficult trips may involve hiking over uneven terrain, with some hikes including significant elevation gain or loss and at higher elevations (up to 12,000 ft). Itineraries may include three to six hour hikes and other activities such as horseback riding, mountain bicycling, rafting and kayaking, which require no previous experience. On many trips, passengers may elect to skip a day's activity, depending on logistics. Most Difficult: Our most difficult expeditions are for the adventurer who is in good physical condition. Itineraries may involve multi-day hiking and trekking excursions over steep, rugged terrain and/or where altitude may exceed 14,000 feet. Many trips include camping in remote areas and/or high altitude sites in varying temperature and weather conditions. Trips may also involve many days of demanding Class IV-V rapids, longer sea kayaking trips, horseback riding, and/or mountain bicycling. Training for the physical demands of these tours is highly encouraged. 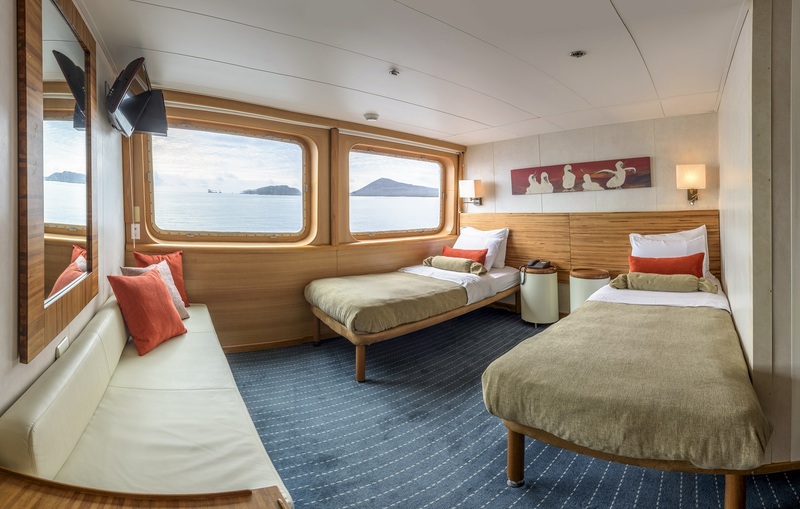 This 300-ft luxury expedition vessel is a perfect choice for families, or for those looking for a larger ship that offers more of a cruise-like experience for their Galapagos tour. 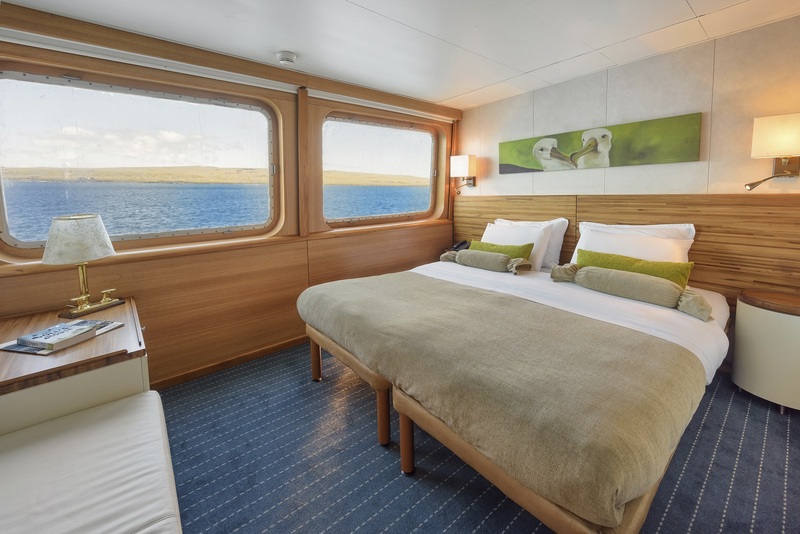 Accommodating 110 passengers, it books only 100, in 4 luxury suites, 24 junior suites and 19 standard plus cabins. Guests also enjoy large decks, a tasteful dining room and a lounge with panoramic windows. Dates: Weekly departures. The Legend offers 4, 5 and 8-day cruises and extended 10 to 15-day cruises. Our Galapagos tours include a pre and post night in Quito or Guayaquil. The great weather of the Galapagos Islands makes them a fantastic destination for travel year-round. Every month of the year is a good time to enjoy a tour of the region. 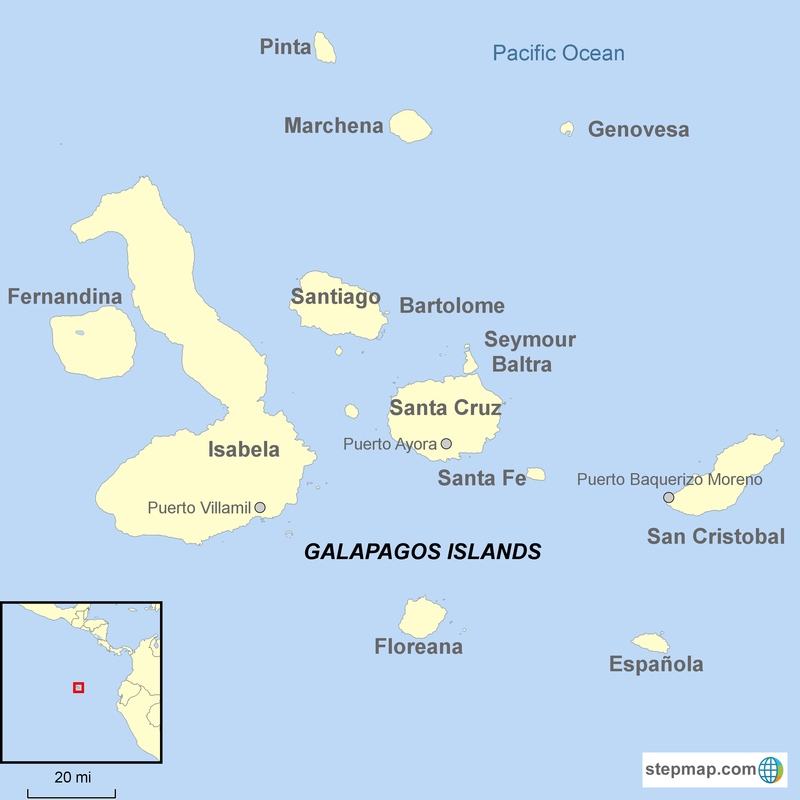 The Galapagos Islands have a subtropical climate that is almost completely determined by sea currents. Although most believe the Galapagos to be a very hot destination, the cool water currents in the area keep the climate more temperate year-round. The islands’ equatorial location ensures twelve hours of sunlight daily, all year long. The mild variations in weather from month to month result in an overall climate of warm days, cool nights and low humidity. Anytime is a great time to travel to the Galapagos; while visiting one can expect to see plenty of sunshine, blue skies and a possible chance of light rain. The hot or rainy season arrives with the coming of the warm Panama current. The warmest months are December through June with temperatures ranging from 72-90°F (22-32°C), with February and March being the hottest and sunniest. The sea is at its warmest (in the 70°F range) and tends to be calmer during this time. Although the islands receive slightly more rainfall during these months, most of the lower elevations remain quite arid. Expect blue skies and sunshine and with a chance of short afternoon showers. July through November is the dry or garua season, which begins with the arrival of cold ocean currents. One can expect cooler temperatures and a light mist in the morning during these months. The skies are also a bit cloudier and air temperatures a bit cooler, in the range of 60-75°F (15-24°C). The garua is a mist that forms in the highlands, providing moisture and usually tapering off by midday, leaving skies slightly overcast or sunny for the afternoon. The air temperature can be slightly lower, but the Equator is still a warm place to visit. During this time of year a cold ocean current from the south, called the Antarctic Humboldt current, causes the water temperature to drop slightly, ranging from 60°F- 72°F (15-22°C). Within both seasons, there are other variants, like altitude, that affect the weather. The lowest point of elevation is sea level and the highest is Wolf Volcano, Isabela Island (5,600ft or 1,710m). There are seven vegetation zones ranging from arid coastal zones to evergreen cloud forests to treeless shrubless pampa zones, all of which are affected by moisture levels, temperature and sunlight. During the garua season, the coast is very dry while the highlands are much wetter. The hot season may or may not have a rainy period which normally lasts four to six weeks, or in the event of El Nino, a longer period. During the hot season, the coastal zones remain arid. Prevailing winds from the southeast keep the southern sides of the major islands much moister then the northern sides, which fall into a rain shadow resulting in the arid zones reaching a much higher elevation. The months of May and December are changeover periods and weather and sea temperatures in these months tend to vary from year to year depending on the change in the water currents. Occasionally, one will feel humidity, predominantly on the south side of major islands. Compared to the humidity levels in the Amazon or the US South, the humidity in the Galapagos is very low and will not disturb activities. Snorkeling is an activity offered on all Galapagos trips. Wetsuits, available onboard most cruises and for all land tours, are recommended June through November. Though sea temperatures vary significantly from island to island, generally all travelers will use a wetsuit during this time. Snorkeling in shallow waters offshore or in protective coves tends to be warmer. Waters to the north, near Genovesa are warmed by the Panama Current, whereas snorkeling off the western island of Isabela is always chilly due to the cold Cromwell undercurrent. The Humboldt Current, or the South Equatorial Current, brings cold sub-Antarctic water that flows through the archipelago eight or nine months a year keeping sea temperatures low. One will experience a variance in sea temperatures while snorkeling on any trip during any time of the year. During the hot season, travelers tend to spend more time in the water, especially at midday when the temperatures are the hottest and wildlife is less active. Snorkeling is an optional activity and those who are not interested in snorkeling have other options. Sea Conditions are a concern of many cruise travelers. All Galapagos vessels are small; the largest accommodates only 100 passengers. Naturally, some movement will be felt on all vessels regardless of the time of year or the size of the vessel. The seas around the Galapagos are generally shallow and despite being the crossroads of several currents, the waters are not terribly rough. The seas are at their calmest January through April. December, May and June are transitional months during which one will experience relatively calm seas, though it varies year to year depending on the shift in the currents. July through November, one will find choppier seas, with August through October being the roughest. Certain vessels are more stable than others and cabin location can also help avoid seasickness. Most travel is done at night while passengers are sleeping with the only exception being the short midday transit (two hours or less). During the day, vessels dock in calm waters near shore. Passengers spend most of the day on land or snorkeling. These factors lessen the risk of seasickness. We recommend that you bring over-the-counter or prescription motion sickness medication, though many cruisers discover that the seas are much calmer than anticipated. If you are concerned about motion sickness, please contact us for more details on how to select the right vessel for you. This vessel's pricing varies depending on travel dates. Please contact us for the most up-to-date pricing. A single supplement applies to single travelers in a private cabin. Departs every other week. Please contact us for departure dates. Hotel upgrades are available, please contact us to discuss your options. All cabins have convertible bedding. The third bed in a triple is a sofa bed. Various cabins are interconnecting, please inquire. Length: 300 feet / 91.5 mts. Beam: 47 feet / 14.3 mts. Draft: 13 feet / 3.9 mts. Q: How do I choose an itinerary? A: The Galapagos is an incredible destination, so no matter which islands or visitor sites you see, you will be impressed by the abundance of wildlife and unique landscapes. In general, we encourage people not to worry about the specific islands they are visiting unless they have a certain species that they must see, such as penguins or albatross. However, we realize that this is a once-in-a-lifetime trip, so if you want to know more, please look here, or contact your Adventure Travel Coordinator for more details. Q: Can I make changes or additions to these tours? A: Yes! While cruise itineraries are set by the Galapagos National Park, we can add extra days in the Galapagos or extensions in mainland Ecuador. Contact an Adventure Travel Coordinator for recommendations. Q: When is the best time to go to the Galapagos? A: With abundant wildlife and pleasant weather year-round, there isn’t a bad time to go to the Galapagos. You can find a wider selection of trip options by avoiding the winter holidays, spring break and the summer months when most people are free to travel and plan vacations. Q: What is the weather like in the Galapagos? A: The Galapagos has a sub-tropical climate with temperatures ranging from the mid 60s to high 80s throughout the year. There are two seasons caused by different prevailing ocean currents. The warmer, wetter season runs from December to May, and a cooler, dryer season takes over from June – November. Even in the wet season, rain is generally confined to brief afternoon showers and shouldn’t disrupt your trip. You can find more information about what to expect under the ‘Weather’ tab on each Galapagos trip. Q: How physically fit do I need to be to enjoy a trip to the Galapagos? 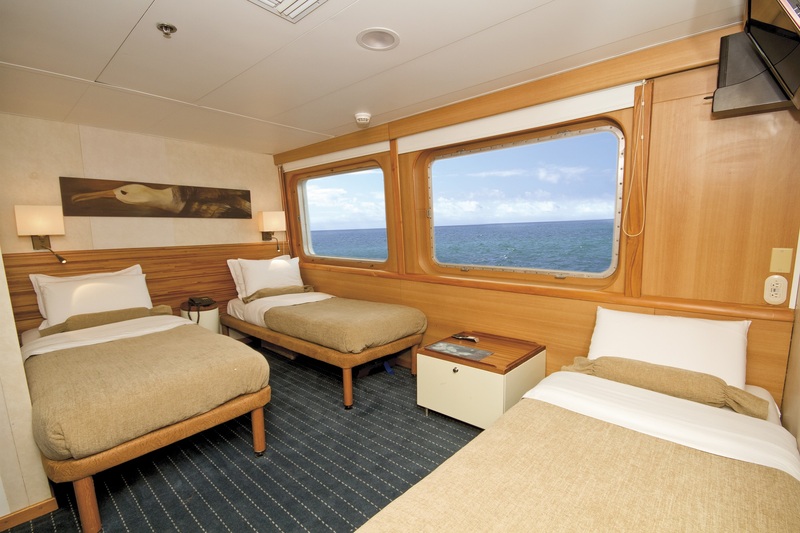 A: While your days in the islands are full, Galapagos cruises are not particularly strenuous. As long as you are able to walk a couple of miles at a leisurely pace and are able to navigate uneven terrain, you will be able to enjoy the Galapagos. Please check the physical ratings on our trip pages for more information. Q: How much time do I need to visit the Galapagos? A: Due to the amount time it takes to get to the Galapagos, we recommend our travelers plan for at least five days in the islands, with eight days being ideal. Cruises run from four to eight days in length with extended 15-day cruises available for travelers who would like to see the entire archipelago. You must arrive in Ecuador at least one day prior to your cruise in order to catch your Galapagos flight. Q: How far in advance should I book? A: The Galapagos Islands are relatively busy year-round and cruises frequently sell out. As a rule, the further in advance you can plan, the more options you will have. For the best selection of cruises, plan at least six to nine months in advance, and a year or more ahead if you plan to travel over the Christmas holiday season or May through July. Q: What are your booking and cancellation policies? A: Click here to see our booking and cancellation policies. Please note that each cruise has its own cancellation policy in addition to our own. This will be detailed in your itinerary. Q: Do you use certified guides? A: All guides on Galapagos cruises are freelance and hired directly by the vessels. Guides on any of the cruises we offer are experienced, fluent in English and hold a degree in a related area. Cruises that are mid-range or above will have the best guides possible. Our more economic options also have great guides, but they may have a little less experience, or basic English skills. Please note, many of the best guides in the Galapagos now choose to skip formal certification process that define the level of each guide because of the high costs and the time it demands. Because of this, the designations of Level I, II, III are no longer an accurate indicator of the quality of your guide. Q: What kind of accommodations can I expect? A: We offer a range of accommodation levels in the Galapagos. Our most economical cruise options are similar to a three-star hotel. 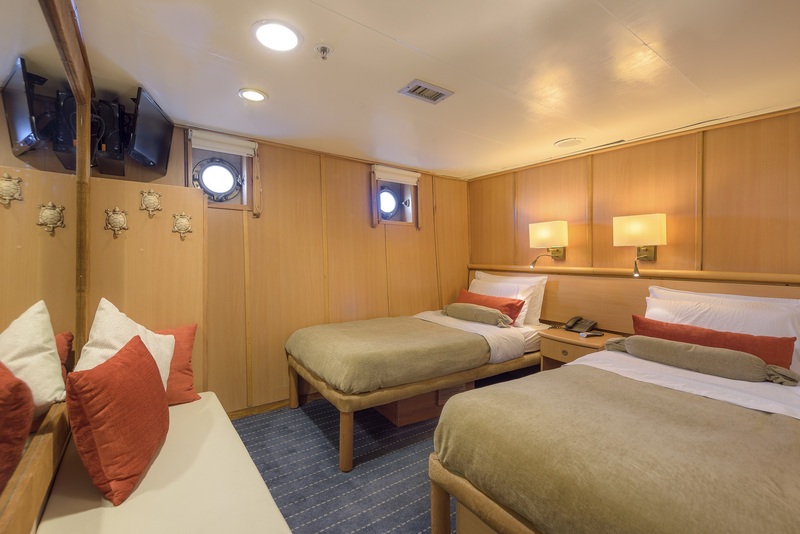 The cabins may be small and basic, but the vessels are still clean and comfortable. 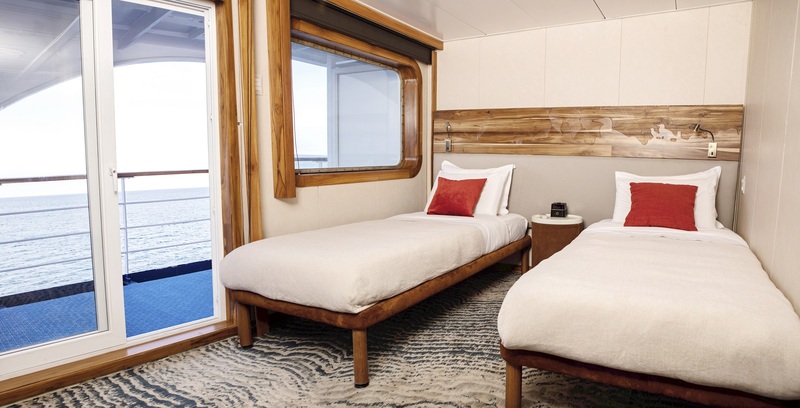 Our mid-range cruises are like a four-star hotel with larger cabins, generally with larger windows and more common spaces throughout the vessel. Luxury cruises are similar to a five star hotel. 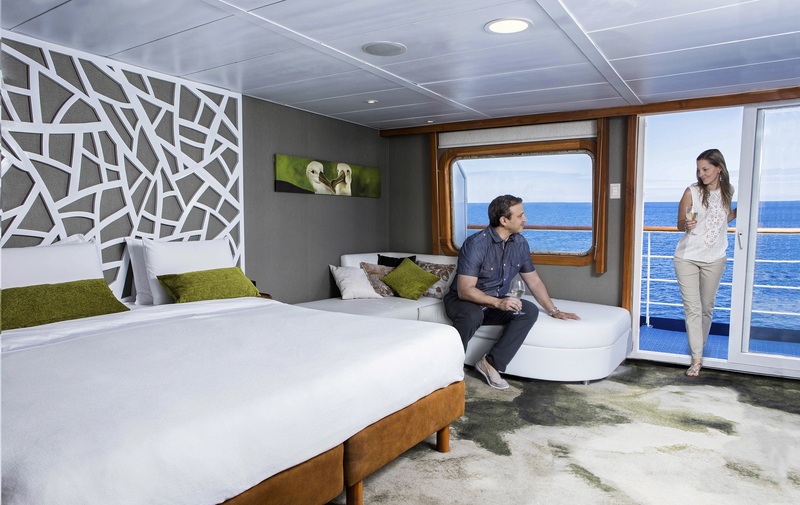 These come with much larger cabins and extra amenities such as private balconies. Hotel accommodations in mainland Ecuador are set to match the cruise level that you book. Q: Do tours include airfare? A: Travelers are responsible for their own international airfare. Internal flights, including Galapagos flights, are quoted separately from our base trip costs. We include your Galapagos airfare in your quote. Q: How many people are on your tours? A: Your tour size depends on the size of the vessel you choose. Cruises in the Galapagos carry between 12 and 100 passengers, but the majority of the vessels we offer accommodate 16 passengers. There are never more than 16 passengers to one naturalist guide. All Quito services and additional tours are private with a guide and vehicle just for your group. Q: What are the benefits of a cruise over a land-based itinerary? A: Both options allow for great wildlife viewing opportunities on land and underwater, and a chance to see a variety of landscapes. 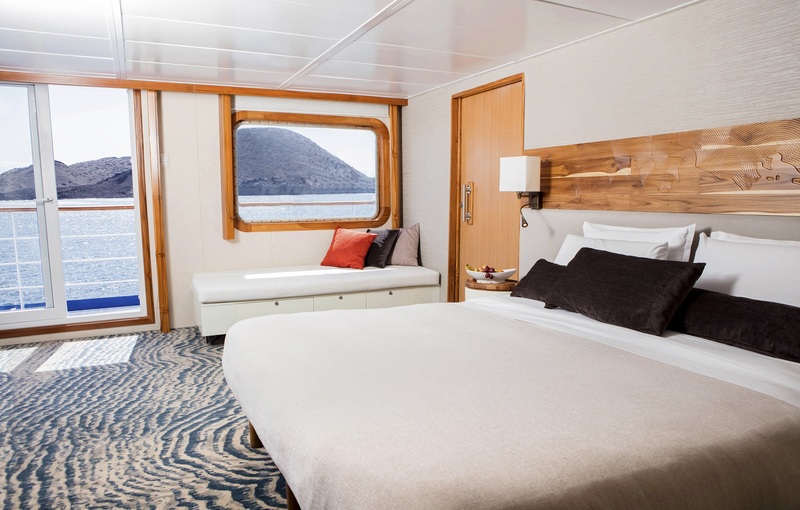 Live-aboard cruises allow you to visit the uninhabited outlying islands, which land tours don’t visit, and to see more islands throughout your trip. Q: Can I snorkel, kayak or scuba dive during my cruise? A: Snorkeling will be included almost every day on all Galapagos cruises. Kayaking is only permitted in certain areas, as mandated by the Galapagos National Park. 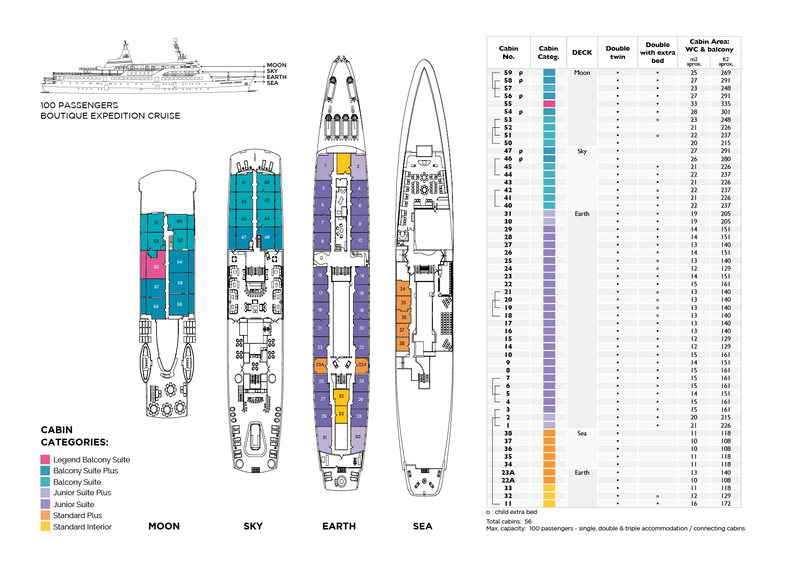 Many cruises have kayaks on board, but not all do. Be sure to check with your Adventure Travel Coordinator if this is a priority for you. Diving is only available on live-aboard, dive-intensive cruises. If you would like to add scuba diving to a naturalist cruise, we can add on land-based dive tours before or afterwards. Q: What if I get seasick? A: Most people worry about motion sickness beforehand and then are fine once on the trip. However, you are on a boat and will feel some motion regardless of which type of vessel you are on. We recommend that all passengers who are prone to motion sickness consult their doctors to obtain preventative medication best suited to their individual needs. As long as you are prepared, you will be fine. Q: Will I get more information on packing, vaccines, currency, electricity, etc.? A: After booking you will receive a link to our online trip portal, which includes all of the need-to-know information specific to your itinerary. This includes packing lists, restaurant recommendations, tipping guides, FAQs, vaccine recommendations and currency information. Your Adventure Travel Coordinator will also be a great resource for any other information you may need.